It protects lashes from damage caused by free radicals caused by the natural body process and/or environmental stresses like ultra-violet light. Before mascara is applied, keep applying Grand Lash Primer to noticeably lengthen and thicken lashes. When desired volume, length and separation is achieved, allow 30 seconds to set. Then apply mascara. 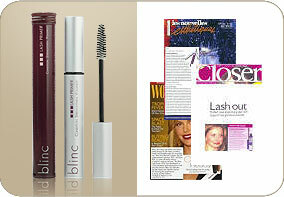 Note: When using with Blinc mascara, upon removal of the Blinc "tubes", Grand Lash Primer will also be removed automatically. This is excellent - product really works - gives WOW factor to lashes. I just use it with my own mascara - it doesn't clog up - highly recommended!!! This stuffs great it really builds up your lashes, but it works just as well with my lancome mascara, infact it works better than with the kiss me mascara! So I'd definatly advise you to buy this but dont feel you need the kiss me mascara to go with it! This is a great product, it gives that dramatic look you have always wanted with your mascara!